Whenever I hear people call their outfit a "casual weekend look," it always makes me giggle. My "casual weekend outfit" is leggings, a giant t-shirt and unwashed hair - and not in a "I'm a cute college student way." It's more of a "I'm an offensive looking person and I need to shower" sort of way. I kind of love when we have no Saturday plans and I never have to leave the house. All that to say, the above outfit was worn last weekend when I actually did have to leave the house. I wore it to my nephew's birthday party and since it's basically a glorified leggings and t-shirt combo, I wasn't too upset. I mean, can we talk about how awesome it is that sweatshirts came back in style? This weekend bum couldn't be happier. Every day for me is weekend casual since I don't work in an office anymore. I am typing this right now unshowered in my leopard robe :-) Love your cognac booties. I love the jeggings! Do they seem to run true to size and hold their shape pretty well? Precious outfit! Thanks so much Heather! I actually got the jeggings a couple of months ago and wear them every time I can! I think they run very true to size (I am usually an 8 in jeans and that is what I got). So far they have held their shape really well. I'm not sure what they'll be like long-term, but I felt good about going for it with the low price! I'm interested to hear how you like them if you get them! Love it! This is a great weekend look. I can never get enough stripes! Also, my weekend look for running errands, etc., is leggings, a tshirt and sweatshirt. So I am a hot mess basically. I am totally with you... my "weekend look" is too embarrassing to wear out in public! haha! 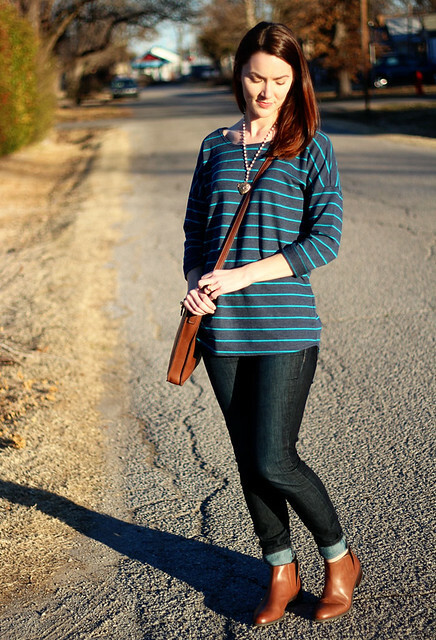 I really love how deep and dark those jeggings are... definitely my favorite shade of denim. Your booties and bag are fantastic too- love how they match! Such a great outfit! 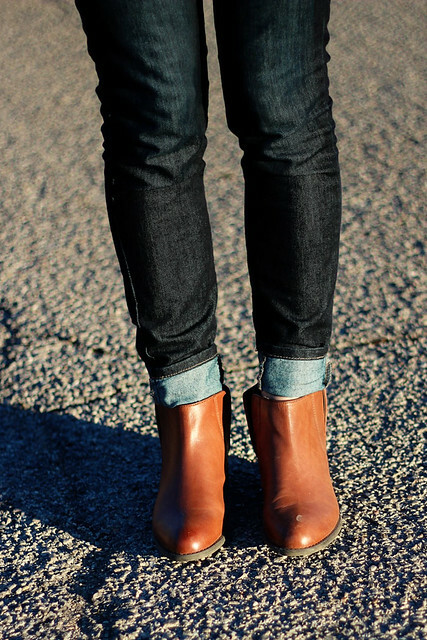 The color of those booties looks beautiful with that denim!! Love everything about this!! Those booties are fantastic! I love is casual look, I was definitely the need to shower, offensive dresser before blogging, now I finally feel I have some cute go-to looks like this to wear instead. You look great! How great is the cute sweatshirt trend. By far my favorite trend of 2013. Hope it isn't going away anytime soon. Thanks for stopping by Just Jilly!! Super cute outfit! I always love anything with stripes. Great boots too! Ugh, a girl sitting in front of me on the bus today definitely had a case of the weekend look today. Greasy hair, oversized chambray, leggings, and wayyyy too much body spray. She should learn from you-- you've got the casual weekend look down. and in no way is offensive to others. Love this outfit and can't wait to see you soon! That necklace is the highlight of the outfit. Cute look! I'm totally with you on the casual weekend outfit- I love it when I don't have to leave the house all day and my sweats and tshirts are not outfits to be seen by the public. Love how you are wearing your boots! Casual Perfection. 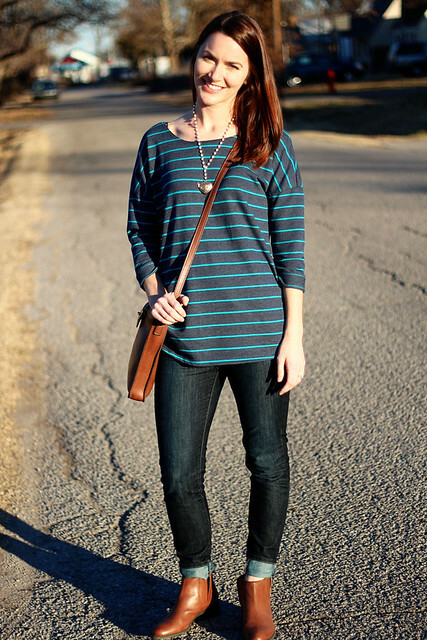 Nothing wrong with jeggings or leggings with a tee or sweatshirt. Your Boots, Necklace & Purse are beautiful & pretty dressy. 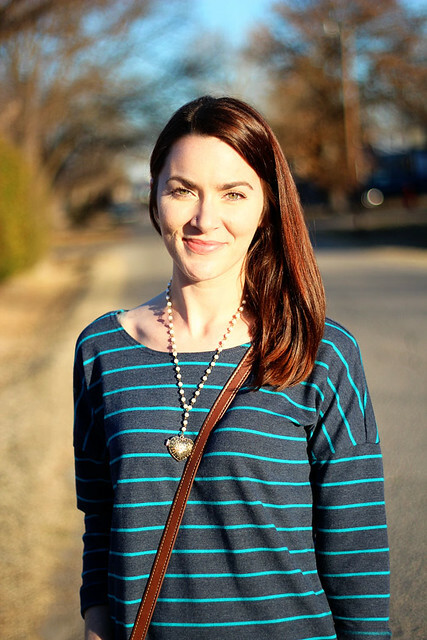 On Wed Jan 29th, I hosted the first ever link up on my page and we featured leggings & boots. I'd love for you to link up, you have until Tuesday at midnight. This Outfit would be perfect for it. Thank you. I have no shame in my commenting game. I decided to check out more of your outfits (you made a follower out of me! ), and I kept loving these boots with every look, and who does the designer happen to be? My very favorite, Franco Sarto. Seriously, I want to meet the man behind the name because I love his footwear! 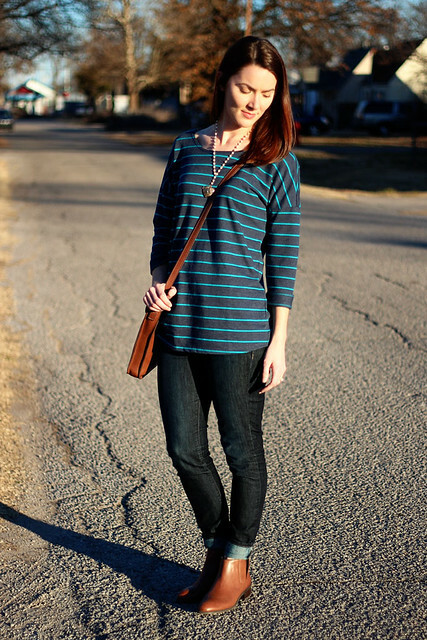 And this outfit is so comfortably chic.